If there was one thing I didn’t miss during the school Winter Recess growing up, it was not having to do homework. I guess those days are over. 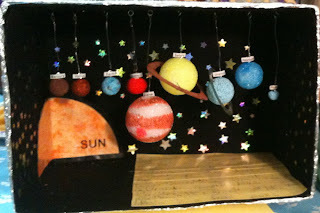 My seven-year-old son was given a 3-week project to do on the solar system. It was to be worked on before the Winter Recess, during the Winter Recess and now for the week after. We wisely chose to do the bulk of the written work both before and after the Winter Break. The project included making a diorama of the solar system in an empty box. We left that to work on during the break because it we thought it would be more fun to do. The written work - the whole project, actually - was beyond exhausting. Especially given at the peak of the Holiday Season. There was, no exaggeration, an eight-page outline of exactly what was supposed to be completed, in what order, and exactly how the accompanying diorama had to be constructed. An entire page was dedicated to Internet sites that the children (read: “parents”) needed to get information from. And the diorama models of the planets needed to look exactly as shown on the Internet sites. To make matters even more fun for the parents, specific craft supplies, within specified dimensions, needed to be obtained to construct this diorama! Try going to Michael’s craft store at the peak of the holiday season, push and shove your way through the isles to get to the Styrofoam balls (of varying sizes, of course), along with other assorted items. Once the materials were collected, you had to stand on line for 20 minutes, while your child is whining that they just want to go home (me too), and why is the line so long (because it is the Holiday Season, Honey, and ALL lines are long during the Holiday Season), and can’t we just do this another time when the store is not crowded (that would probably be sometime around mid- June)?? Later, we found that the “planets” would need to be hung from the top of the box in some fashion. My husband went to Home Depot to get special hooks to hang these darn “planets” from. Back to the paperwork, we still needed to have my son color in each of the planets on a sheet of paper in the exact colors shown on the Internet, and label them. Since my son loathes using crayons, and prefers using markers because he enjoys seeing his art project “come to life” using markers or paint, he wasn’t terribly happy about having to use specified crayons to color in his planets. He was downright frustrated when our small box of crayons had some colors either broken or missing. And while I have a supply of markers in every color imaginable, I didn’t even have one stinking box of crayons in my vast supply! Off to Staples I went the next day (I wasn’t dealing with Michael’s again!) and bought the 64 crayon box, so that my son would have a plethora of crayons to chose from, all new, and all which could be used to accurately resemble the actual colors of each planet! This is just a sample of what the parents had to engage in before, during and after the Winter Break! 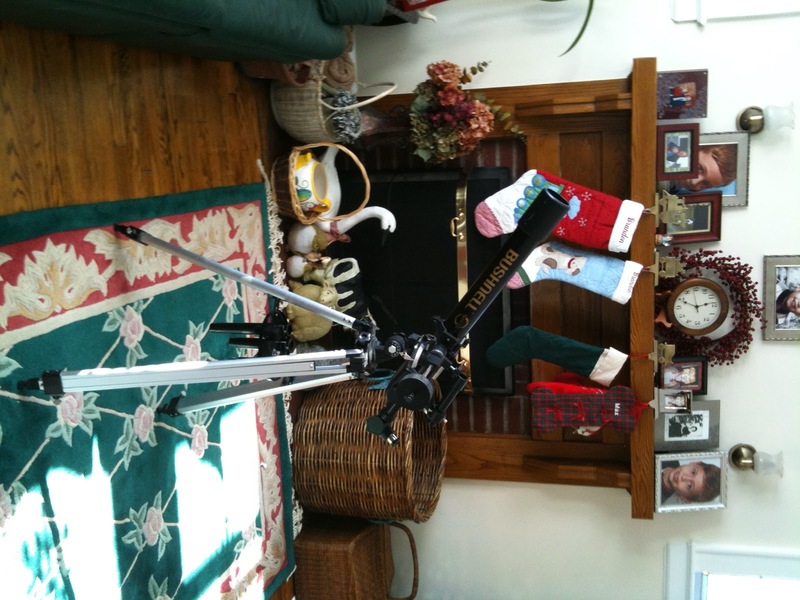 For Christmas, my cousins knew how hard we all were working on this taxing project that they bought my son a real telescope for Christmas! My son has been looking for planets every night since! So, although this project, due this Friday, has been a major inconvenience and huge hassle in every conceivable way for us parents, it has engaged my son. It all taught us something (mostly patience while waiting on long lines! ), and proved that hard work and diligence really does pay off in the end. But please, teachers. If you have to give children such a large project to do, please choose a time of year OTHER than the Holiday Season!! It would be so very much appreciated!! Thank you!